World War II in Europe began on this date in 1939 in Danzig (now the present-day Polish city of Gdańsk) when the Ger­man training ship Schles­wig-Hol­stein, under the guise of a cere­monial visit to the city, bom­barded Poland’s naval base in Danzig har­bor. After a fierce day­long fight Danzig fell and was annexed by the Reich the next day. Mean­while, Her­mann Goering’s Luft­waffe, with its large fleet of modern air­craft, had no diffi­culty in achieving con­trol of Poland’s air­space. The Luft­waffe first attacked the Polish town of Wieluń, deep inside Poland, destroying 75 per­cent of the town and killing close to 1,200 peo­ple, most of them civil­ians. 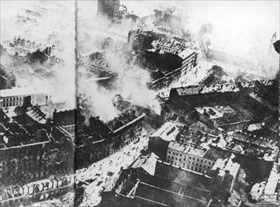 Warsaw, Poland’s capi­tal—under heavy aerial bom­bard­ment since the first hours of the war—was attacked on Septem­ber 9, besieged on Septem­ber 13, and pum­meled by 1,150 German air­craft on Septem­ber 24. On the ground all six panzer (armored) divi­sions and ten mecha­nized infan­try divi­sions thundered across the 1,400‑mile border, accom­panied by some 40 divisions of more conventional infantry. 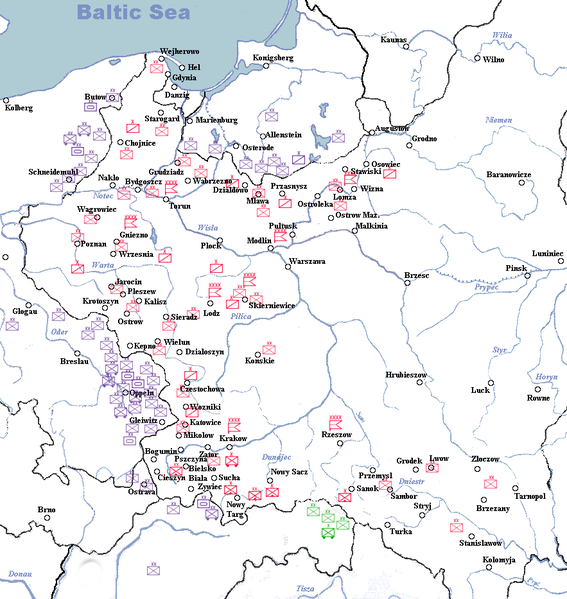 As Ger­man ground units advanced from the north (Danzig and East Prussia), the south (German-allied Slova­kia), and the west (see map), with their goal of con­verging on War­saw, Polish forces with­drew from their for­ward bases near the Polish-Ger­man fron­tier to more estab­lished lines of defense in the east. The Polish defense plan called for an en­circle­ment stra­tegy: Ger­mans were permitted to ad­vance in between two Polish Army groups in the line between Berlin and War­saw-Łódź, at which point a Polish reserve army would move in and trap them. Polish mili­tary stra­tegists, how­ever, failed to pre­dict the head-spinning pace of Ger­man pan­zer and motorized units, a mis­cal­cu­la­tion that led to the Septem­ber 8 cap­ture of Łódź in Cent­ral Poland, the country’s third-largest city. This proved to be a major set­back to the Poles’ plan to defend the coun­try west of the Vis­tula, the river that bisects Poland south to north as well as Warsaw itself. Although the British and French had declared war on Ger­many on Septem­ber 3, pledging to guarantee Poland’s inde­pen­dence, they made no pro­mises that they would come to Poland’s aid imme­di­ately. Luft­waffe chief Goering hoped that the con­flict would be over quickly, avoiding a world war. That all seemed likely when the last Polish Army group in the field surrendered on October 6, 1939. Above: German and Polish deployment of land forces on Septem­ber 1, 1939. The last en­gage­ment between the two armies took place between Octo­ber 2 and 5 roughly 75 miles south­east of the Polish capital, Warsaw (Battle of Kock). Hitler was con­vinced that once Poland was defeated and divided between Ger­many and the Soviet Union, which had entered the con­flict against the Poles on Septem­ber 17, 1939, Britain and France would not seriously continue the war. Left: The Battle of Westerplatte was the first battle in the Ger­man inva­sion of Poland. Beginning on Septem­ber 1, 1939, Ger­man naval and land forces assaulted the Polish Mili­tary Tran­sit Depot on the Wester­platte penin­sula in Dan­zig’s har­bor. Manned by fewer than 200 Polish sol­diers, the depot held out for seven days in the face of heavy attacks that in­cluded dive bombers. 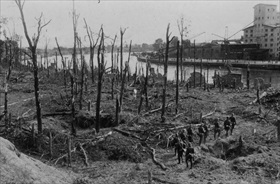 In this photo German soldiers make a sweep of the area on September 8. 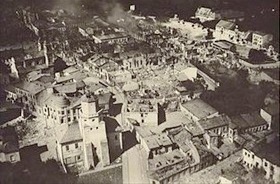 Right: Wieluń city center after three Ger­man air raids on Septem­ber 1, 1939. The bombing of Wieluń, which held no mili­tary value, is con­sidered to be one of the first terr­or bombings in his­tory and may­be the second in Europe. The church, syn­a­gogue, hos­pital, and most of the town’s other buildings were destroyed by 70 tons of bombs. The casu­alty rate was more than twice as high as the Basque town of Guernica, Spain, bombed by German and Italian air forces in 1937. 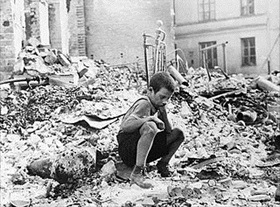 Left: Burning Warsaw, September 1939. The Luft­waffe opened the Ger­man attack on Poland’s capi­tal on Septem­ber 1, 1939, deploying 1,750 bombers and 1,200 fighters during the inva­sion. As the Ger­man Army approached War­saw on Septem­ber 8, Junkers Ju‑87 Stukas and other bombers attacked the city. On the 13th, Luft­waffe bombers caused wide­spread fires. Finally, on Septem­ber 25 Luft­waffe bombers, in coor­di­na­tion with heavy artil­lery shelling by army units, badly damaged War­saw’s city cen­ter. The next day the Polish gar­ri­son surrendered, and on September 27 German troops entered the city. Right: From the first hours of the war, War­saw—called the “Paris of the North” owing to the splen­dor of the city—was a tar­get of unre­stricted aerial bom­bard­ment. In addi­tion to mili­tary facil­i­ties such as army bar­racks, the air­port, and an air­craft factory, Ger­man pilots tar­geted civil­ian facil­i­ties such as water works, hospi­tals, mar­ket places, and schools. Between air and ground assaults, War­saw suf­fered approx­i­mately 40,000 civil­ian deaths. Forty per­cent of its buildings were damaged and 10 per­cent were destroyed in the first month of war. In this photo a nine-year-old boy rests in the rubble during a search for food for his family.